We know, we know… enough about the volcano already. But for those stranded in Paris, it’s still the issue of the moment. From my current position in New York, I refuse to pity you, and I’m secretly hoping that when I return to Paris in May, the tectonic plates will shift in a way that will force me to stay there forever. Fingers crossed! But for now, why not kill a few hours by picking up some unique Parisian items while you still have the chance? We’ve written at length about particular shops and goods in Paris. Here are a few favorites that are well worth checking out while you wait for the ash to settle. Merci. 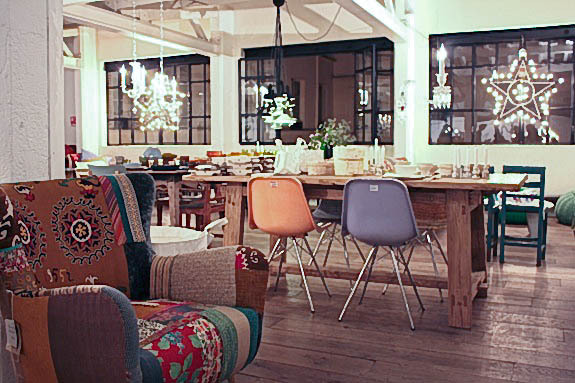 This spacious concept store has everything from home goods to vintage clothes and fresh flowers. You could literally spend a whole day inside, stopping for lunch at the restaurant in the basement or fueling up on coffee in the library’s cozy cafe. The best part? A large part of the proceeds are used to support a young women’s co-op in Madagascar. 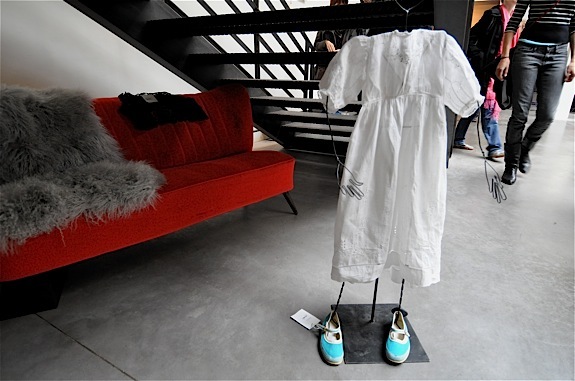 Make My D. Nathalie Bui (sister of “It” designer Barbara Bui) recently opened this chic womenswear boutique in Montmartre. Bui has an eye for pieces that balance classic elegance with a contemporary edge. 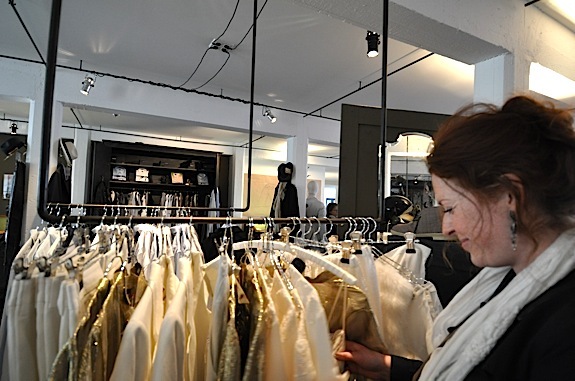 Her well-edited collection (which includes pieces from a range of European designers) has something for everyone, and she’s usually on-hand to offer expert advice. Thank God I’m a V.I.P. 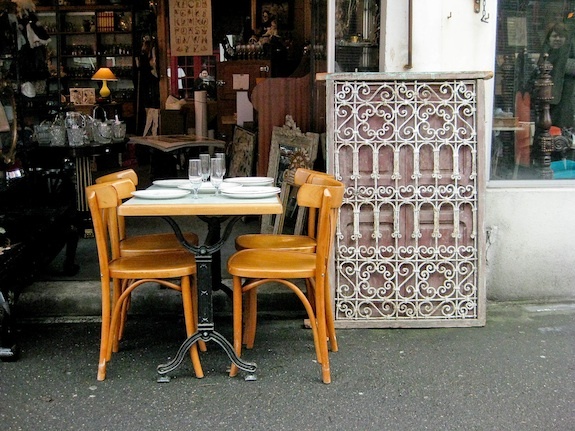 Vintage lovers need look no further than this spot near the Canal St. Martin. It’s a spot where you can find affordable items from brands like YSL, Alaia, and Lacoste, mixed in with more exotic no-name items. No wonder it’s one of our best kept retail secrets. Repetto. I’ve already gushed enough about this one, but no closet is complete without a pair of classic Repetto ballet flats. They’re the perfect everyday shoe, and think about it: every time you slip them on, you’ll think of Paris (or of Icelandic volcanoes). The Flea Markets. Paris’ famous Marchés aux Puces are the perfect places to pick up one-of-a-kind items. They’re overflowing with everything from furniture and art to jewelry and vintage clothing. And whether or not you buy anything, you’ll get a kick out of browsing the stalls and schmoozing with the quirky vendors. A.P.C. — For classic French staples with a modern twist. Repettos— Available in certain styles from Shopstyle.com and various department stores. Anthropologie—Channels the spirit of flea market fashion… but slightly more convenient for those in the U.S.
Roger & Gallet—Indulge in lotions and bath products from this go-to French brand. Any other favorite French products or brands available near you or online? Let us know!